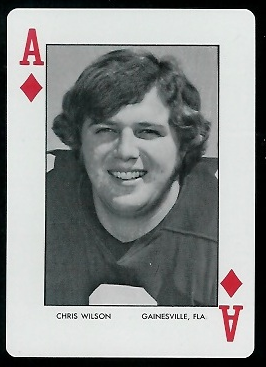 Chris Wilson wasn’t shuffled into the 1972 Auburn deck of cards. But in the ’73 deck he was the Ace of Diamonds. Chris Wilson still remembers the details. A freshman suddenly eligible under the new varsity regulations, Wilson was punter and place kicker on Auburn’s 1972 Amazins squad that overcame preseason predictions to enter the Iron Bowls with an 8-1 record. “Fat Daddy did his best to keep us (Gossom and teammate James Owens) laughing, and his exploits are legendary,” writes Gossom in a chapter titled “Fat Daddy and The Zoo”—”the zoo” being the name given the athletic dorm by outsiders, according to Walk-On. Speaking of zoos, Wilson and his wife Roxie are owners of The Zoo Gallery, an eclectic collection of home furnishings, jewelry, clothing and artwork produced from local artists that that the two opened in Ft. Walton Beach, Roxie’s hometown, in 1979. The couple met while attending Auburn and were married at the Moore’s Mill house of Art Professor Hugh Williams in 1975; both of their children graduated from Auburn as well (in 2004 and 2010). 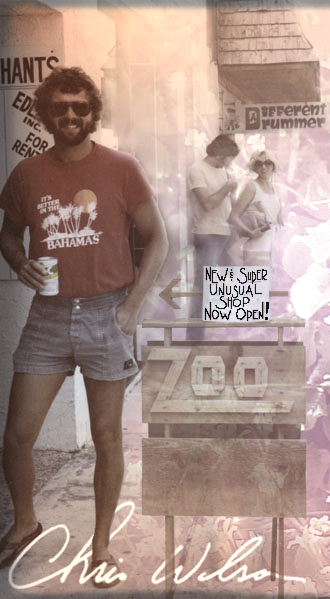 Now in its 35th year, The Zoo Gallery has since expanded across the state, with current locations in Grayton Beach, Miramar Beach, and Destin. Wilson also fondly recalls Auburn’s great 1974 season (10-2), as well as the end of “Shug” Jordan’s tenure as Auburn coach (“A gentleman, even if he was getting old”). 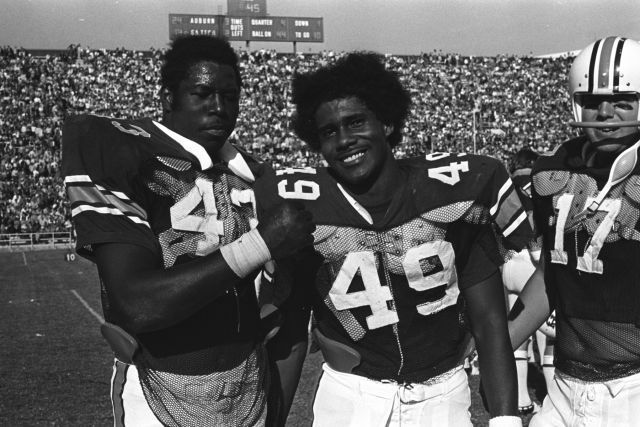 But he still considers those final moments against Bama in 1972 his finest hour ever as an Auburn Tiger. Related: Lee Carpenter’s wonderful life.